Introduction: As the performance of upper GI endoscopy and especially endoscopic retrograde cholangiopancreatography (ERCP) has increased since 1968, so has the incidence of duodenal perforation. The frequency of use of ERCP varies among hospitals and depends on availability of trained endocopists, equipment, and facilities. Methods: A retrospective review was carried out of ERCP-related perforations of the duodenum to identify their incidence, optimal management, and clinical outcome. 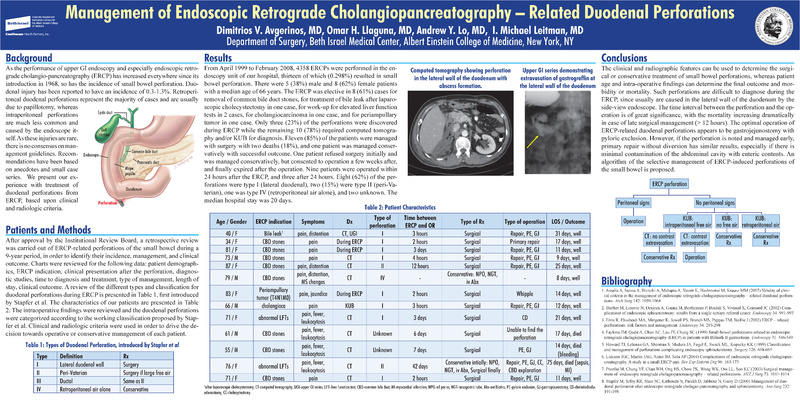 Charts were reviewed for the following data: ERCP indication, clinical presentation, diagnostic methods, time to diagnosis and treatment, type of injury, management, length of stay, clinical outcome. Results: From April 1999 to September 2007, 4300 ERCP procedures were performed, ten of which (0.23%) resulted in perforation to the duodenum. There were 4 male and 6 female patients with a median age of 67.8 years. In these cases, ERCP was elective in 9 cases (removal of common bile duct stones in eight and for treatment of bile leak after laparoscopic cholecystectomy in one). Only two of the perforations were discovered during ERCP while the other eight required computed tomography for diagnosis. Nine were managed with surgical repair with one death (11%), and one patient was managed conservatively with successful outcome. Eight patients were operated within 24 hours and only one after 24 hours. Seven (70%) of the perforations were type I (lateral duodenal), one (10%) was type II (peri-Vaterian), one (10%) was type IV (retroperitoneal air alone), and one unknown. The median hospital stay was 18 days. Conclusions: The clinical and radiographic features can be used to determine the surgical or conservative treatment of duodenal perforations. An algorithm for the selective management of ERCP-induced perforations of the duodenum is proposed.